ne just has to look at the company's stock price to see what he's talking about. 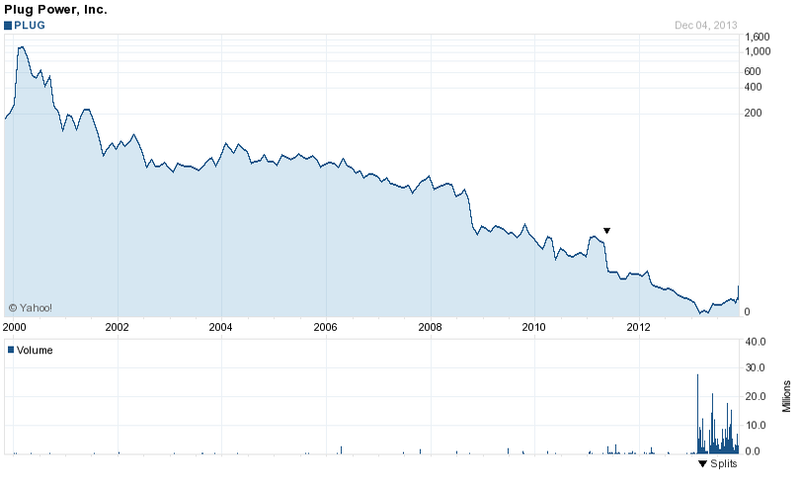 Plug Power received the investment from Air Liquide when shares were trading near $0.12 in early May. Since then, the stock has returned nearly 700%. While the above chart may look daunting for prospective investors who want to gain exposure to Plug Power's promising future, the chart below shouldn't. Plug Power has come a long way since its IPO in 1999, and is finally ready to explode back onto the map of Wall Street investors. The more than decade long downward spiral of Plug's shares seems to be at a halt, and the recent business updates from the fuel cell provider act as validation that not only Plug Power, but the fuel cell industry as a whole is ready for a rebound. Confirmation of this turnaround was given to investors on the morning of December 4th, when Plug Power held an analyst event, conducted a conference call, and announced more than stellar sales expectations for the last month of the year. The company is expecting a "blowout" quarter to wrap up the year, and this shouldn't be its last. Shares rocketed more than 60% higher in early morning trading, hitting a high of $1.41, and finally settling at $1.28 for the day. Shares were up nearly 5% at $1.33 in after hours trading. 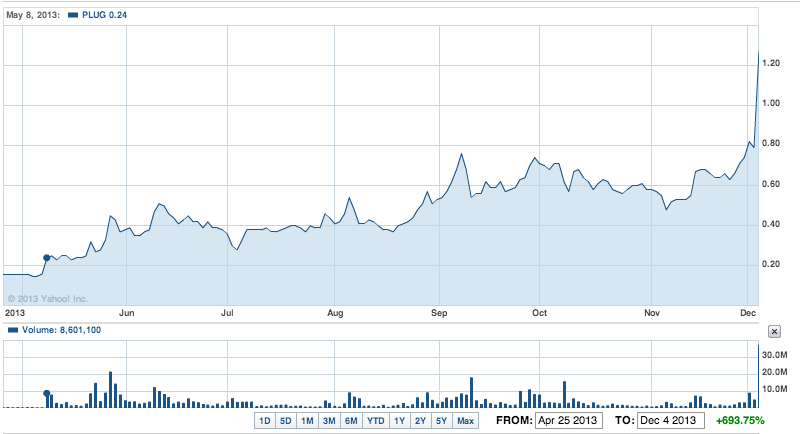 Plug Power has appreciated nearly 100% since I first highlighted the company in mid October. The short, mid, and long-term business prospects of Plug Power has never been better, and with a current market capitalization of approximately $140 million, shares are still highly undervalued. I'm still holding onto my core position, and view any selloff as a buying opportunity, here's why. CEO Andy Marsh laid it out plain and simple for investors during this week's conference call, the company expects to book $30-$40 million in revenues for the 4th quarter, if not more. Compare that to $1 million in revenues for the first 5 months of 2013, $11 million from May 15th to October 8th, and $17.8 million from October 8th to December 4th. This is impressive growth for a company that was on the verge of bankruptcy earlier this year. The company expects to break even this quarter, and post profitability during the first half of 2014, for the first time ever in its 16-year long existence. I have to tell you, as I -- our service was a big problem for me a year ago. Today it is a huge opportunity. I'd just like to remind everybody of our goal next year. I'm feeling really good about our goals. And I got to tell you, it's a different feel about the company than it was in the last December at this time. I have been here 5 years, and I got to tell you, I go home, I would say in my first year I was learning the business and I was comfortable. Now I really know the business, and I've never been more comfortable because this is a business that is about to explode. I'm just so pleased to be part of such team. Plug Power has a strong relationship with its existing customers, and the key here is Plug only has a few thousand forklifts deployed to date (~4,000), which is far less than the combined 250,000 forklifts deployed by their different customers. The GenDrive forklift is durable, effective, and efficient, and is helping large companies with distribution centers maximize profits and reduce costs. It seems like Plug Power's Fortune 500 companies are ready to pull the trigger and fully commit to Plug Power forklifts and their hydrogen turnkey service, which provides recurring revenues for the company. A typical turnkey deal that the company provides would generate $8 to $12 million in revenue. Here's the potential one specific customer can offer to Plug Power. Kroger (KR) operates more than 40 distribution centers, and Plug now expects to provide 2 to 3 sites per year with 200 to 300 GenDrive units. This represents approximately $6 to $10 million in revenue per distribution site, meaning Plug Power has the potential to generate anywhere from $12 to $30 million in annual revenue from one customer, out of 24 total customers (and counting). It seems clear that Plug will have to soon beef up its work force to support the strong demand of the company's products (though Marsh explained that the current workforce can handle up to $100 million in annual revenue). With multiple deals waiting to be announced later this month, it seems like $70 million in revenue for 2014 is a conservative estimate. The transport refrigeration unit market could potentially be larger than our material handling market. The value it brings to our customers is logistics simplification. Plug Power's engineering team will complete their work on the current GenDrive units by 2014, which will allow them to develop new and innovative products which can lead to substantial growth for the company's bottom line in the future. The growth potential behind Plug Power is massive, and the company, nor the industry, can be ignored anymore. The company has a number of positive announcements to make by the end of the year, and in the beginning of 2014, which may help sustain Plug's positive momentum. The company plans to announce either one or two large, multi site deals by the end of the month. If the company's share price can hold above $1.00 for nine more consecutive days, then the company will avoid the much-dreaded reverse split and gain compliance with NASDAQ on listing requirements. This will only add to the positive momentum of Plug's share price. The company is expected to add two to three new auto manufacturers as customers by the first quarter of 2014. Auto manufacturers, such as BMW and Mercedes, have found Plug's GenDrive units to be extremely advantageous for them and their overall operations, due to the constant, heavy lifting required by forklifts at auto manufacturing plants. And I would expect that as the company brings more and more good news to the market over the next 3 to 4 weeks, it will have a positive effect on our stock price. There is more to come form Plug, and any announcement of more deals, the addition of new customers (Amazon seems likely), or the development of a JV to expand into Asia and other countries should help boost this company's share price, and to reaffirm for investors that the fuel cell industry is indeed making a comeback. Plug Power experienced a massive spike in volume on Wednesday, and the company has plenty to prove now that more investors have taken notice. The risks associated with any small cap stock still apply here, but the event of a reverse stock split, which was expected by many just last week, seems to be out of the question. In my last article, I highlighted that a 100% increase in share price would be reasonable for Plug Power; this turned out to be an extremely conservative figure. Plug Power still has multi-bagger potential at current levels of $1.33, and based off of the potential revenue from Kroger alone, Plug power has the long term ability to become a billion dollar company. The fuel cell industry has ample room for growth, and investors can gain exposure not only from Plug Power, but from Plug's stack provider, Ballard Power Systems (BLDP). Fuel Cell Energy (FCEL) is another player in the industry.The confidence behind CEO Andy Marsh and the excitement behind Plug Power has picked up considerably since Plug Power provided an update in October of this year, along with the share price. While Plug Power will be subject to the everday metrics of trading and profit taking, I believe we may see a swift increase in Plug's share price as more and more large site deals are announced. Prospective investors should monitor the stock closely and view any pullback as a buying oppurtunity. The future looks bright for this beaten down stock. Information was sourced from 12/04 CC. No Comment to " Plug Power Passed Its Inflection Point And Is On The Verge Of Exploding "